Stan Lee’s Former Manager Being Investigated for Elder AbuseLee has also had a restraining order placed on Keya Morgan, who was recently arrested on suspicion of filing a false police report. Stan Lee Files $1 Billion Lawsuit Against POW! EntertainmentThe comic book legend claims he was conned into selling the exclusive licensing rights to his name and likeness. Stan Lee Sues Ex-Business Manager for Abuse, Fraud, Selling His Blood as MerchThe lawsuit alleges Jerardo Olivarez is one of several “unscrupulous businessmen” who targeted Lee following his wife’s death in 2017. 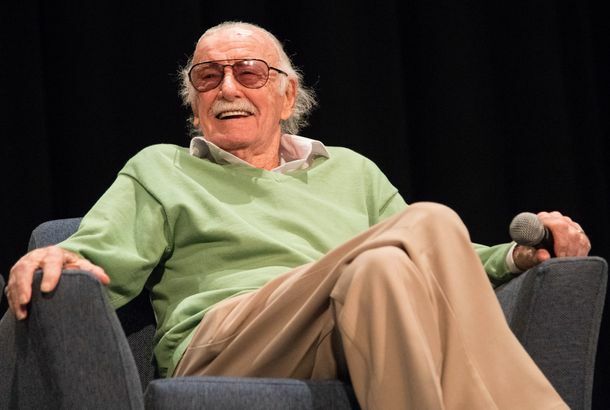 Everyone Around Stan Lee Claims Everyone Else Is Doing Him WrongThe figures surrounding the comic-book legend have accused each other of mistreating him. Stan Lee Denies Sexual Misconduct After Allegations SurfaceHe’s reportedly been accused of harassing nurses and a masseuse. Stan Lee Pens 35th Anniversary Elvis Presley ComicWith Indian graphic artist Jeevan J. Kang. A Short History of Comic Book Superteams and How We Got The AvengersIn the forties, Marvel and DC’s superteams met to discuss crime fighting. Today they synchro-smash on the big screen. Watch Every Stan Lee Cameo EverThe Man. The Myth. The Cameo. Stan Lee Wants a Cameo on The Walking DeadAs a zombie, of course. Arnold Schwarzenegger’s TV Show Will Be a Cartoon Called The GovernatorIt will embellish his real life. Watch Luke Perry and Stan Lee Not Freak Out Around Their FansThe ‘90210’ alum and the Marvel maven both attended the annual Dragon*Con sci-fi and fantasy convention. MTV Creating New Gang of Comic-Book HeroesTo be illustrated by an undiscovered teen. Stan Lee’s Super Seven Faces LawsuitComic legend faces complaint from toy company. Marion Cotillard Survives Close Brush With Environmental WorkPlus: John C. Reilly sorry, guesses he will just hump pillow. Stan Lee Cameo in Iron Man 2 Revealed!We’re hoping Lee insists on wearing suspenders made of unstable molecules. Beyoncé Battles YouTube, GravityMatt Damon, Barbara Park, and more!